Marty grew up in a fishing family, both his dad and grandpa being avid anglers. Trolling pop gear and a worm on the local reservoirs or drifting salmon eggs on the streams were the common fare. Trips to the Uinta Mountains would bring out the fly and bubble, a favored technique of Marty’s. At age ten, Marty was proficient with his fiberglass spinning rod and Mitchell 300 reel. fishing. While being guided on the Teton River, with fly rod in hand, Marty had his first real taste of casting a fly. Standing in the front of a raft fishing hoppers with a whole lot of willing Cutthroat was all it took to spark a desire to learn how to fly fish. By age 21, Marty was fully engaged in the sport. His wife gave him his first graphite fly rod in the form of a rod building kit. The J. K. Fisher blank was top of the line and quickly replaced the Eagle Claw fiberglass rod he had been using. Fly tying became an integral part of his fly fishing experience as well. Marty can still recall the events leading up to the first fish he caught on a fly he had tied. Though the event took place over 40 years ago, he can still remember every detail as if it were yesterday. The fly — a Brown Bivisable, tied on an old Mustad hook. The hackle used to tie the fly was well out of proportion, but was all he could afford at the time. The fish didn’t seem to care and were eager to accept his offering. Marty’s passion for fly fishing continued to grow as he spent time on the water. Being self- taught, Marty searched for greater understanding by procuring as much reading material as possible. In 1983, Marty broke into the fly fishing industry by taking employment with Outdoor Sports, a sporting goods retailer. Marty, with the owner, worked to mimic the feel of Wolff’s Sporting Goods, which had gone out of business. It was while working for Outdoor Sports that Marty began building custom fly rods. An unforeseen occurrence, a big warehouse style store moving in down the street, forced Marty back into the job market. Fulfilling a lifelong dream, Marty with the help of his parents, opened Spinner Fall Fly Shop in 1985. Along with establishing and managing the fly shop, Marty increased his rod building activities and named the entity M. Howard Rod Company. During these early years, Ralf Moon from St. Anthony, Idaho, took Marty under his wing and taught him how to build bamboo fly rods. Shortly after opening the fly shop, Marty secured a permit to guide Utah’s Green River below Flaming Gorge. Being one of the first fly fishing guides on the Green proved to be advantageous in many ways. An opportunity to work on a film production with Jim Teeny and ESPN Sports on the Deschutes River in Oregon launched a film making adventure. Teamed with Reese Almond Productions, he went to work on a program titled Seven Miles to Little Hole. The project was completed in the late 80s. Marty and Reese went on to produce a thirteen part series on fishing in Utah. The thirty minute programs, which include every aspect of fly fishing, from the Art of Fishing Dry Flies to Float Tubing for Trout, aired throughout the intermountain west on local and PBS television stations. three times a years. Sadly, with the passing of his father, Monty, in 2002 and irreconcilable family differences, the fly shop was closed and the guide service was sold to Scott and the boys. 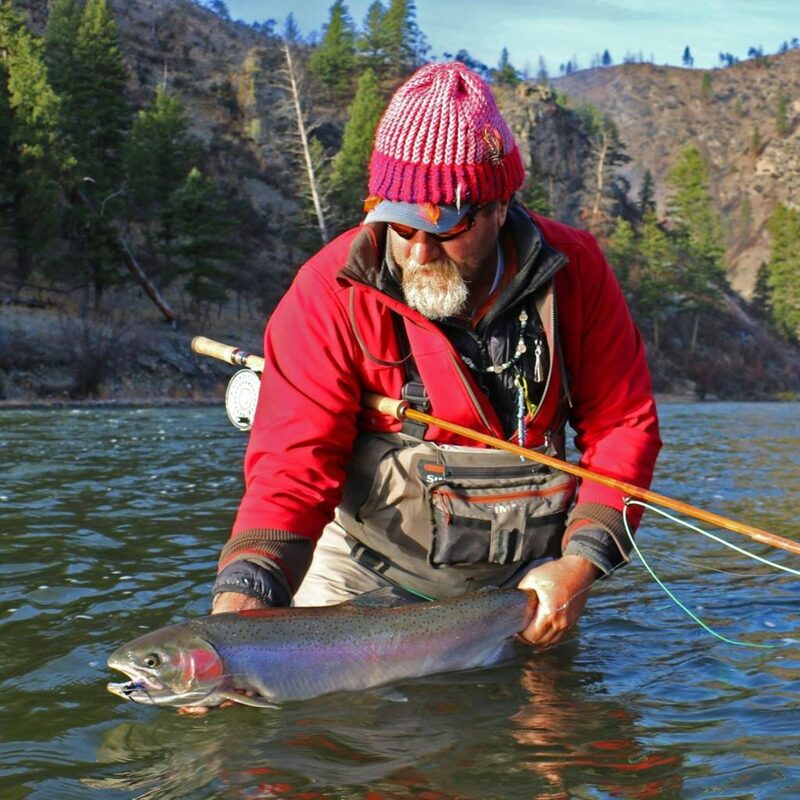 Spinner Fall Guide Service to this day continues to provide an exceptional service to the fly fishing community. In the early years, Marty’s love for tying quickly spread into all aspects of fly fishing, and within the first year of his newly formed addiction, he started tying flies for species of fish that live far from his local waters. Marty’s passion for tying has taken him all over the world in a search for fish that will take one of his finely dressed flies. Marty’s passion for tying flies can be seen in his desire to pass his knowledge onto anyone who wants to learn. Marty travels to a number of fly tying expos each year in his quest to pay it forward. One of Marty’s earliest goals attached to his fly tying was to learn how to take photos of his flies. With the introduction of digital cameras, Marty has seen his goal become a reality, and his fly shots are second to none. His willingness to share can be seen on a number of informational web sites in the form of step-by-step tying instruction. He also has a number of tying DVDs, from “Tying Guide Flies” to “Steelhead Flies – Tying the Classics.” A fly tying book co-authored with Dec Hogan is on the horizon and near completion. Marty’s favorite pastime is swinging flies for steelhead, but he still enjoys presenting small dry flies to finicky trout in small streams. He has completed Utah’s Cutthroat Slam twice and though he gets to travel and fish all over the world, his love for fishing small streams in Utah is as strong today as it was when he started fly fishing. He has been very fortunate to have experienced fly fishing at its best in both fresh and salt water, but is still in search of the ghost fish that haunts his dreams. Most importantly, Marty has been involved with the local fly fishing clubs throughout his fly fishing experience. Marty served as the vice president for the Stonefly Society for two years in the mid 80’s. His love of fly fishing can be seen in his efforts to perpetuate the sport. He has the experience and expertise to instruct fly tying, fly casting and rod building as well as every other aspect of the sport. Marty’s slide show presentations bring out the pure essence of fly fishing. Marty has always done whatever he can to share his knowledge and skill to help anyone interested in fly fishing feel the pure joy of the sport. Marty is one of Utah’s true fly fishing advocates.